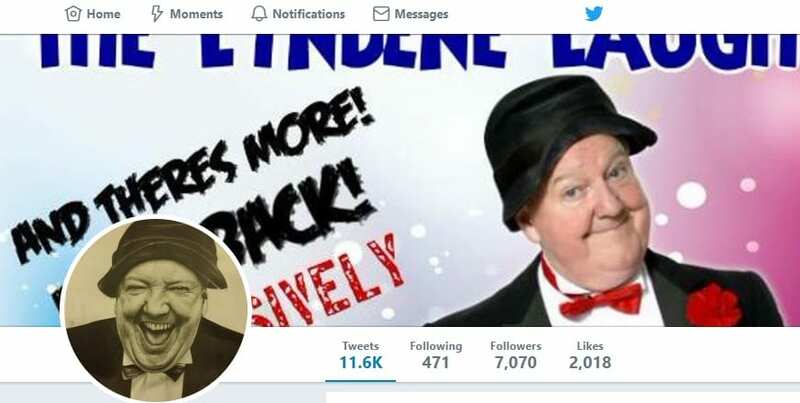 Jimmy Cricket, the well-known Northern Irish comedian, regularly uses social media to tell some of his famous one-liners. And here is a selection of some he has posted on Twitter over the past few months. Come closer folks… so I’m looking at a shrivelled-up fried egg on my plate and I’m thinking, you’re not what you’re cracked up to be! They keep putting up give way signs. 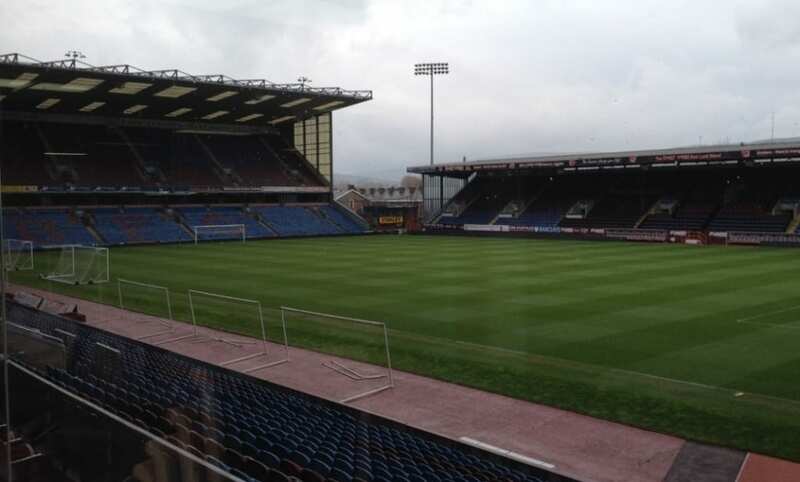 Where will it all end? 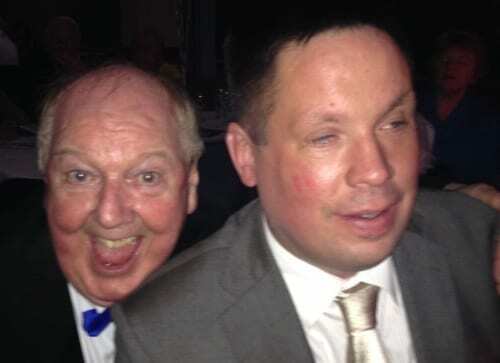 My uncle Patrick has fallen on his feet. He’s got a painting and decorating shop and he’s now selling Brexit wallpaper… it’s got a soft border! People have their time in history. For instance, Alexander Graham Bell invented the phone, but if Thomas Edison hadn’t invented the light bulb before him he wouldn’t have been able to find it. I’ve just been offered a job advertising sleeping bags… it’s all very hush hush at the moment. It was pouring down when we got to the pet shop yesterday. In fact, it was raining cats and dogs and guinea pigs! I’ve got a bump on my head. It’s my own fault for trying to swim in the bath! My cousin Rufus has got the sack from his job as a railway station master because of a complaint from a lady train driver… she said he’s been sending out the wrong signals! 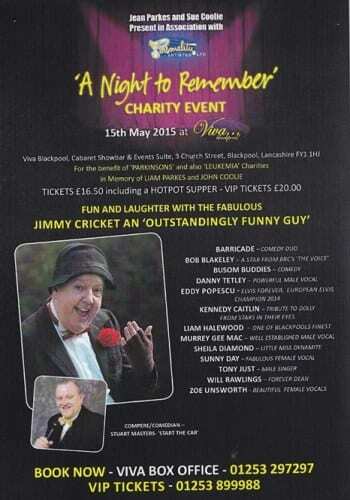 Jimmy Cricket’s recent performance at the Concordia Theatre in Hinckley, Leicestershire, was captured on film. Matt Holt took these photographs, which are courtesy of MGL Media. 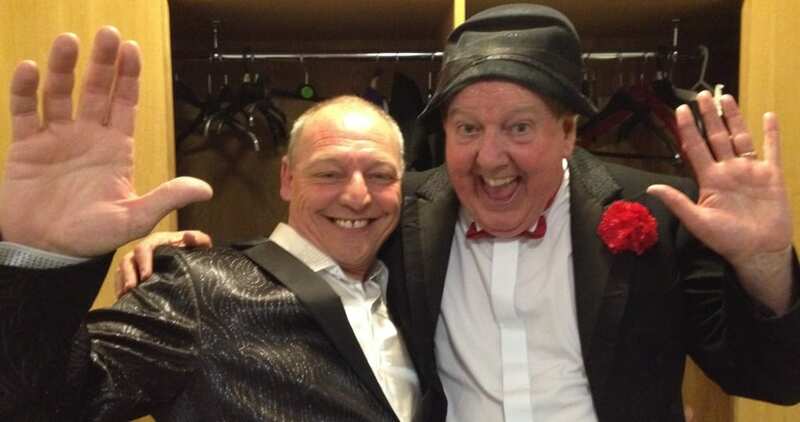 It was the second of two variety shows, which well-known entertainer Jimmy did with Midlands crooner Michael George. The other one took place at the Trinity Arts Centre in Gainsborough, Lincolnshire, seven days earlier. They each featured Michael, his wonderful eight-piece band, his troupe of dancers, a supporting female vocalist, and comedian Jimmy as the special guest star. The Concordia Theatre show is an annual event, which Michael holds each year to raise money for charity, with all proceeds going to Leicestershire-based Hope Against Cancer. 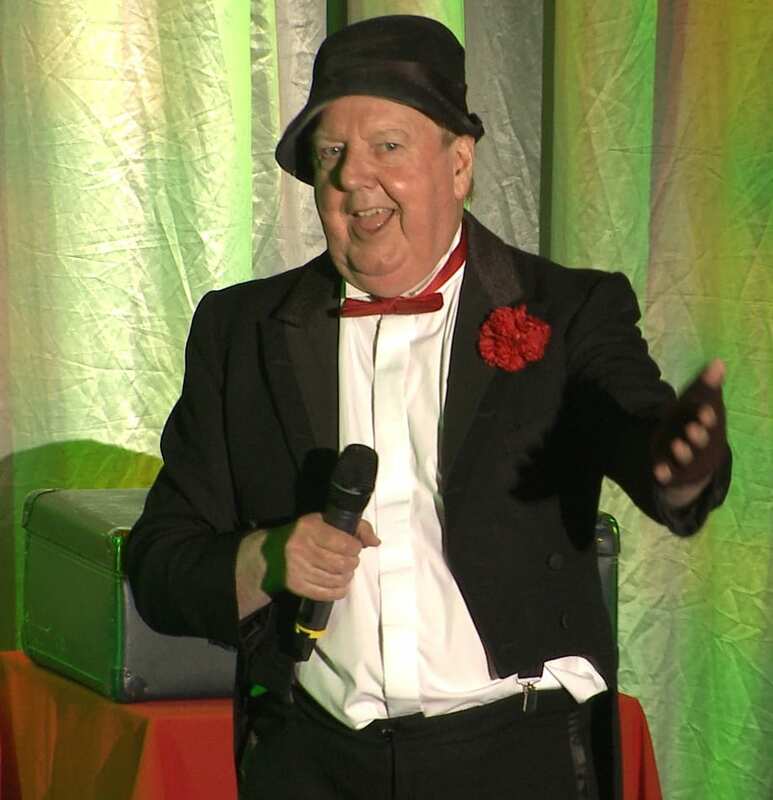 Jimmy Cricket teamed up with the Midlands crooner Michael George to do two variety shows across two counties. The performances, both organised and funded by Michael himself, took place at the Trinity Arts Centre in Gainsborough, Lincolnshire, and the Concordia Theatre in Hinckley, Leicestershire. 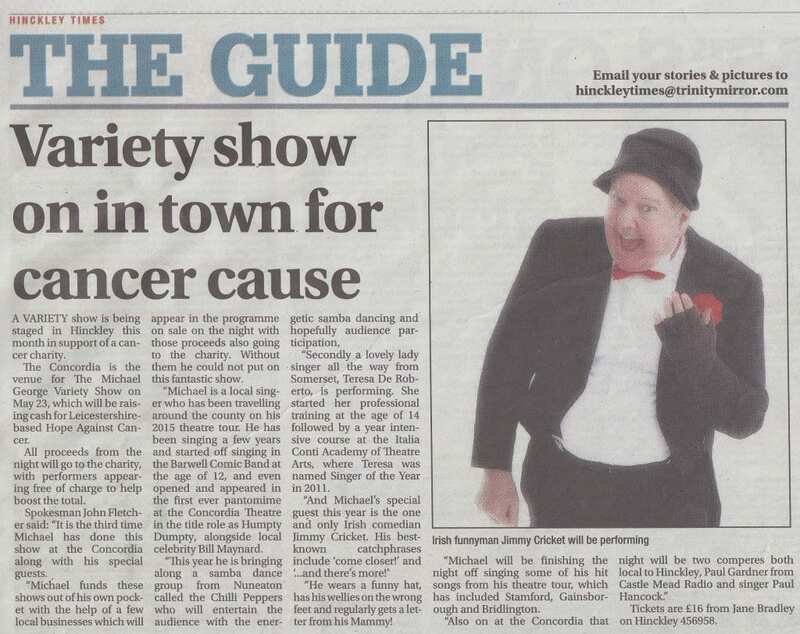 The Concordia Theatre show is an annual charity event, which Michael holds each year to raise money for charity, with all proceeds going to Leicestershire-based Hope Against Cancer (as reported in the Hinckley Times newspaper, below). 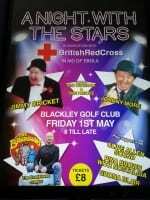 Well-known Northern Irish entertainer Jimmy said: “I really enjoyed appearing alongside Michael, who I think has an infectious desire for performing and singing. 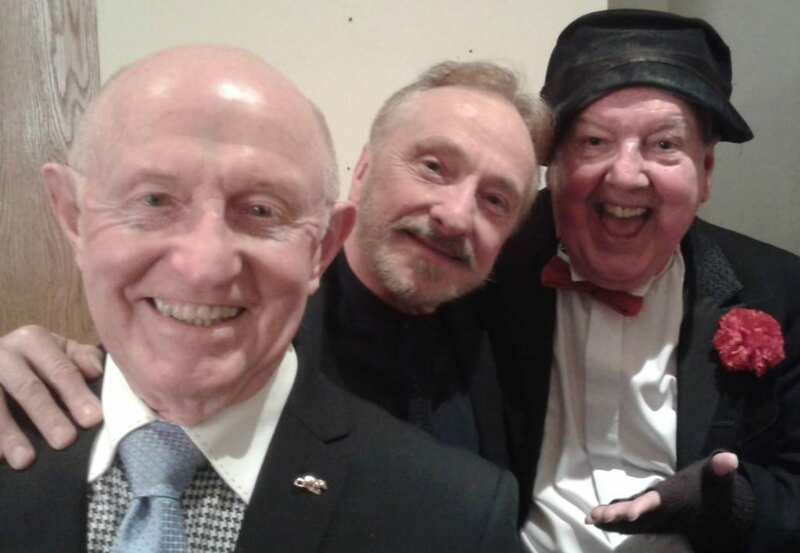 Jimmy Cricket has formed a new partnership with an independent record store, whose clients include singer-songwriter Noel Gallagher, entertainer Mike Harding and folk band Houghton Weavers. 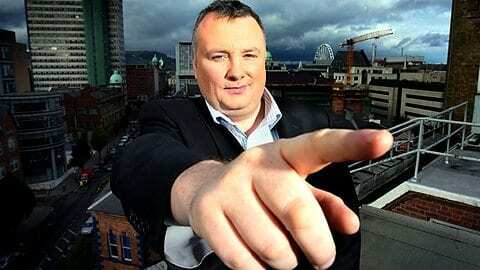 The well-known Northern Irish comedian has agreed for Townsend Records, who are based in Great Harwood near Blackburn in Lancashire, to exclusively provide and manage a new digital store, where downloads of all four of his CD titles can be obtained – both as a full album or as individual tracks. 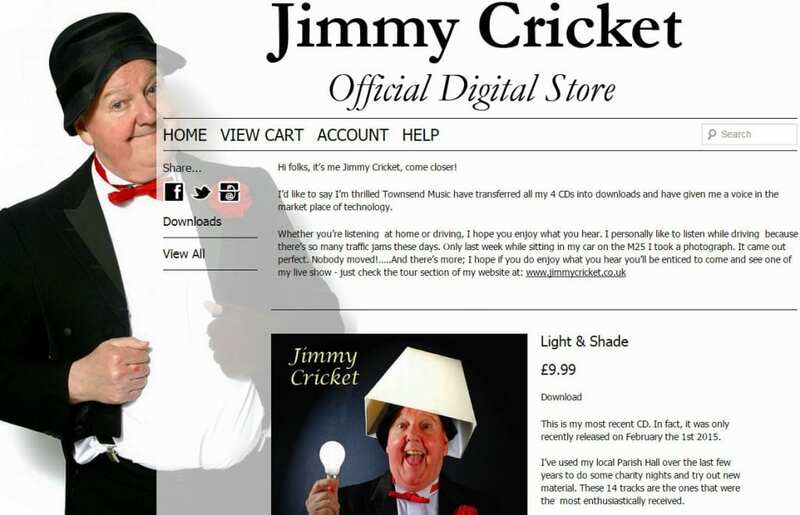 This means that his two comedy CDs – Best of Jimmy Cricket and Jimmy Cricket – Bee in his Bonnet – and his two music CDs, Jimmy Cricket – I’m dreaming of a far off land and Jimmy Cricket – Light & Shade, are now available to purchase in a digital format online. Each individual track can be downloaded at a cost of 99p each, with each full album priced at £9.99 per download.